Swedish melodic metal band ECLIPSE has returned with their sixth studio album, the follow up to the excellent 2015 release Armageddonize. 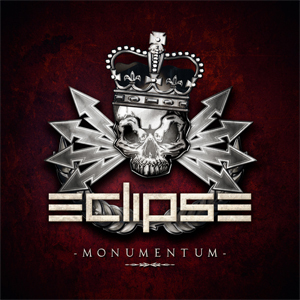 The new album is called Monumentum (a portmanteau of monument and momentum), which is an appropriate title, since ECLIPSE is capitalizing on their success and gaining popularity worldwide. New drummer Philip Crusner fits like a glove in the lineup; he joins longtime members Erik Martensson (vocals), Magnus Henriksson (guitars) and Magnus Ulfstedt (bass). The album opens with the energetic and bouncing “Vertigo”, which is quite an enjoyable blast to get your blood pumping. Henriksson’s guitar riffs leap from the speakers on this track, (as well as the entire album), but the vocals are aptly the focus here. “Never Look Back” offers positive reinforcement and keeps the tempo flowing. A video for the song can be viewed on KNAC.COM right HERE. “Killing Me” and “Jaded” are both interesting tracks and potential hit singles in my opinion. “The Downfall Of Eden” has a lot of appeal as well. The lone ballad “Hurt” is a poignant song, with heart-on-the-sleeve lyrics like “Don’t try to understand it, you have never felt your heart turning colder than it will today”. This song also has potential to be a huge single. “Born To Lead” features possibly the biggest chorus on the album. “No Way Back” is very catchy, while “Night Comes Crawling” features one of Martensson’s most impassioned lead vocals. Closer “Black Rain” begins slowly, but develops into a stomping mid-tempo power metal monster. This is the most epic track on the album, and features a blazing guitar solo from Henrikkson. Some nice keyboard flourishes accent the track as well. Probably one of the best songs ECLIPSE has ever recorded. Bottom line, this band is great at what they do, which is anthemic melodic metal with catchy lyrics and a commercial edge. You will feel refreshed after listening to Monumentum. This album is so upbeat and up-tempo, it’s impossible not to sing along. This is an album with no bad songs in my opinion, which are all in the three to four minute range. This makes for an enjoyable listen, which seems to go right by (in a good way), with a total of 11 songs clocking in at 43 minutes. Martensson’s production on the album is perfect and sounds great at maximum volume. I believe this may be ECLIPSE’s best album to date! Here’s hoping the band makes a North America appearance eventually. Pick up your copy of Monumentum in the KNAC.COM More Store right HERE.